In November 1914, an advert was placed in the national press asking for donations. The ‘Sailors & Soldiers Christmas Fund’ was created by Princess Mary, the 17-year-old daughter of King George V and Queen Mary, with the purpose of providing everyone wearing the King’s uniform and serving overseas on Christmas Day 1914 with a ‘gift from the nation’. 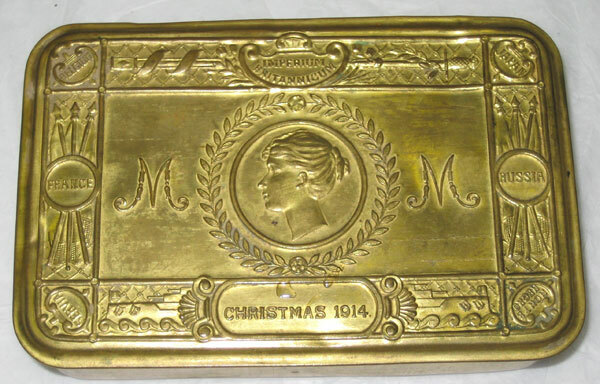 The result was the production of an embossed brass box containing gifts, which would also go to the wounded on leave or in hospital, to nurses, and to the widows or parents of those killed. Prisoners of war at the time had theirs reserved until they were repatriated. The tin itself was approximately 13cm (5″) long by 8cm (3¼”) wide by 3cm (1¼”) deep with a hinged lid. The surface of the lid is decorated with a portrait of Princess Mary, surrounded by a laurel wreath and with an ‘M’ either side. At the top are the words ‘Imperium Britannicum’ with a sword and scabbard either side, and at the bottom are the words ‘Christmas 1914’, flanked by the bows of battleships forging through a heavy sea. In the corners are the names of the Allies: Belgium, Japan, Montenegro and Servia, with France and Russia either side. 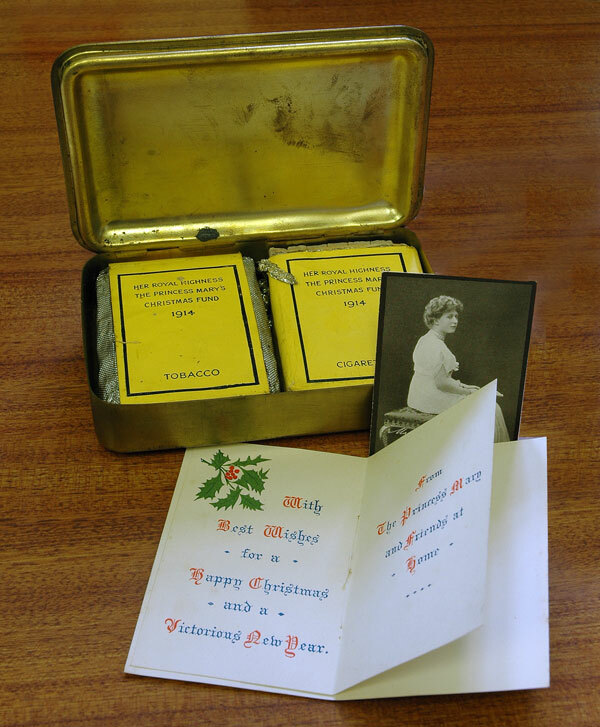 Smokers: embossed brass box, a pipe, an ounce of tobacco, a packet of cigarettes (20) in a distinctive yellow monogrammed wrapper and a tinder lighter. Non-Smokers: embossed brass box, a packet of acid tablets, a khaki writing case, paper and pencil. 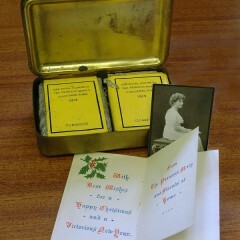 There were also boxes for Indian troops, who received sweets and spices, and nurses were sent chocolate. A simpler gift was given out to all other servicemen (‘Classes B & C’) which consisted of a bullet pencil. Every box contained a Christmas card and a picture of the Princess. Those which were not distributed until after Christmas were sent out with a card wishing the recipient a ‘victorious new year’. 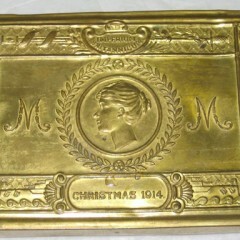 More than 355,000 tins were successfully delivered by the Christmast dealine, but a shortage of brass meant that many entitled personnel did not receive their gift until as late as the summer of 1916, and in January 1919 it was reported that ‘considerable’ numbers had still not been distributed. Orders for brass strip were placed with the USA, who were not yet involved in the war, and a large consignment was lost with the ship ‘Lusitania’. As so much brass was being consumed in the production of weapons and munitions, the quality of the boxes which were manufactured later on was poor, as they were made of a plated inferior alloy. When the fund finally closed in 1920, almost £200,000 had been donated for the provision of more than two and a half million boxes with contents.